Their pincers might make earwigs appear to be dangerous, but even the curved pincers of males cause little to no harm to humans. Indoors, they are more of a nuisance and will eventually die out. Earwigs feed on the roots of flowers, vegetables and shrubs. 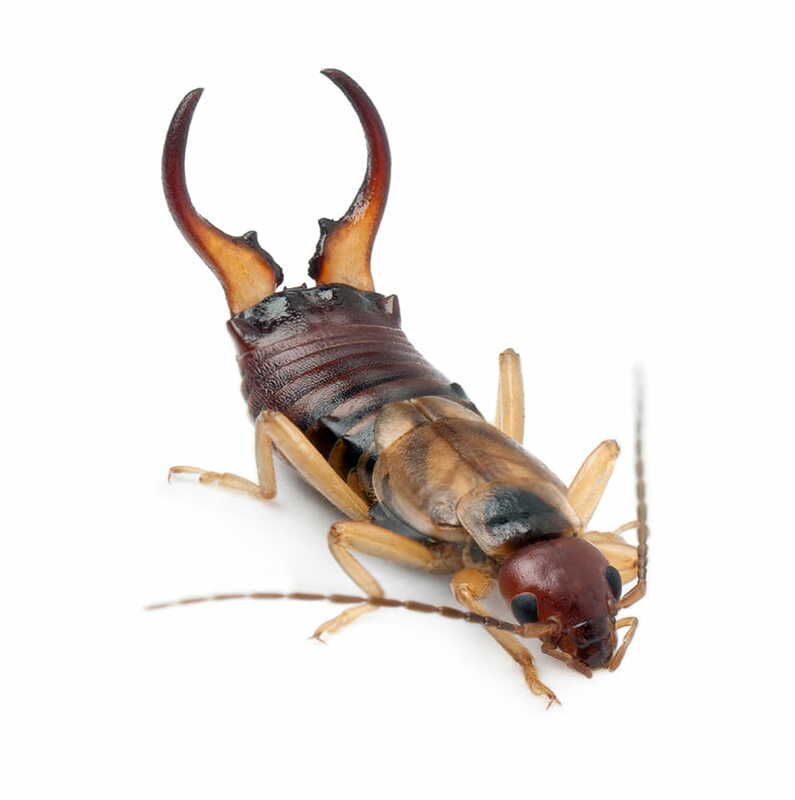 Earwigs are reddish brown and range from 12 mm to 19 mm long. Earwigs feed on the roots of flowers, vegetables and shrubs. Indoors, they are more of a nuisance and will eventually die out. 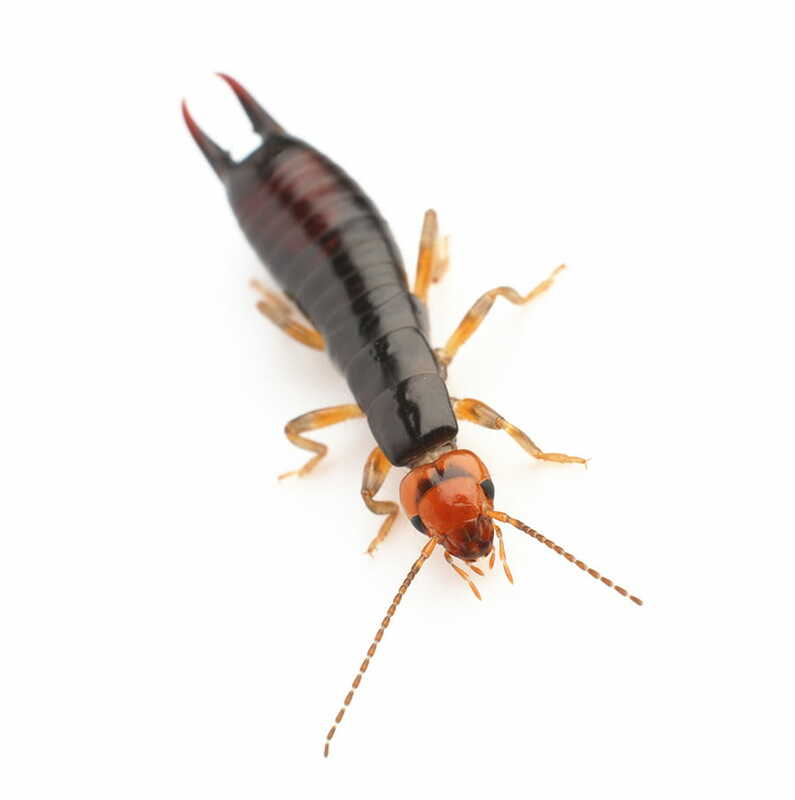 Earwigs are reddish brown and range from 12 mm to 19 mm long. They have a pair of large, curved forceps at the rear of the body. Despite having wings, earwigs seldom fly. Earwigs prefer a dark, moist areas such as beneath stones, boards, sidewalks and debris. In properties, they crawl under rugs, cushions, baseboards and dark, damp crevices, especially in basements. During the day, earwigs will hide in these areas and come out at night. They can easily enter properties while scavenging for food or searching for shelter. They feed on both plant and animal food. Female earwigs lay about 30 eggs beneath soil, twice per year and the eggs hatch in about three months. She will guard the eggs until newly young earwigs hatch and go through their first molt. Since they multiply fairly quickly, the infestation can quickly increase to the thousands. Earwigs generally live for one year. How do l recognize an earwig? The most common earwig in Canada is the European earwig. It is easily identifiable by forceps-like appendages at the base of the abdomen. They have flat, elongated body that range from 12 mm to 19 mm. Males are larger than females. Colour ranges from reddish to dark brown. Earwigs feed on the roots of flowers, vegetables and shrubs; while indoors, they are more of a nuisance and will eventually die out. When are earwigs most common? During the warm summer months, particularly in June, July and August. When am I most likely to see earwigs? Earwigs are nocturnal and are most active at night. Where do you find earwigs? Earwigs prefer a dark, moist areas such as beneath stones, boards, sidewalks and debris. In the properties, they crawl under rugs, cushions, baseboards and dark, damp crevices, especially in basements. Are earwigs hazardous to humans? No. Their forceps may look dangerous but will inflict nothing more than a slight pinch. These forceps are used for defense and courtship. Female earwigs lay about 30 eggs beneath soil, twice per year, and the eggs hatch in about three months. She will guard the eggs until newly young earwigs hatch and go through their first molt. Since they multiply fairly quickly, the infestation can quickly increase to the thousands. Do earwigs die off in cold months? No. Earwigs become dormant during the winter, either as adults or eggs and sometimes tunnel as deep as six feet below the soil surface to escape the cold. For this reason, if an earwig problem is left unchecked, they will return next season in increased numbers. Can weather conditions affect the size of an earwig infestation? Yes. Since they prefer dampness, a moist spring will encourage larger numbers of earwigs. For this reason, if the summer months are dry, earwigs will enter properties in search of damp conditions. Can I do anything to prevent an earwig infestation on my property? Yes. Since earwigs like moist, dark places, try to eliminate debris around the property such as grass cuttings, mulch patches and wood heaps. If I have an infestation of earwigs, what can be done to eliminate them? 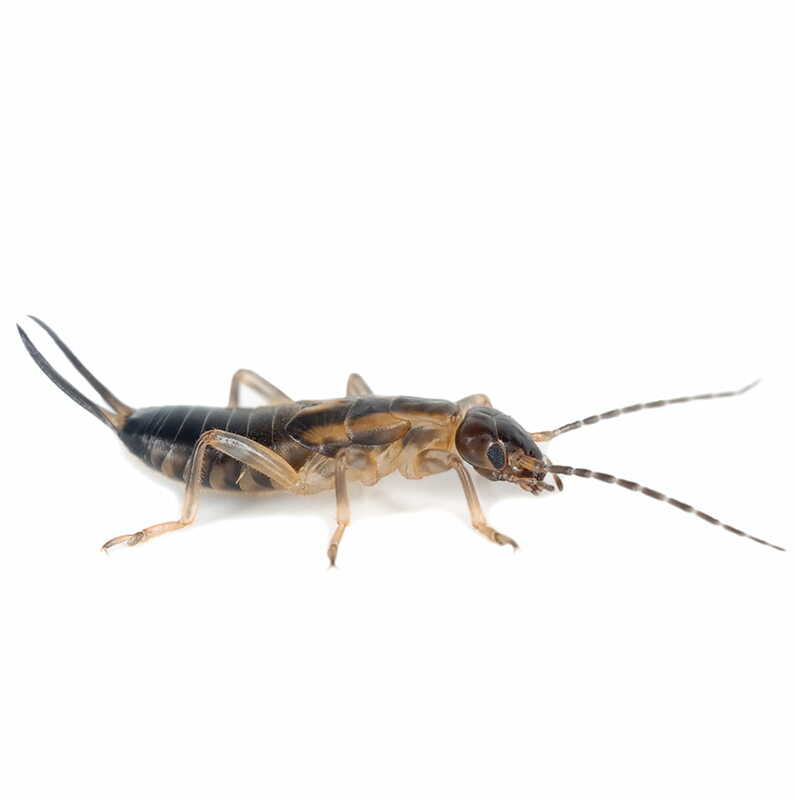 Your local Abell Pest Control office has products and equipment especially formulated for the control of earwigs. Due to the nature of earwigs, control can be difficult and an Abell professional should be consulted for thorough results.